Recorded and mixed by Ben Leinbach and Jai Uttal at Old Bull Productions in San Anselmo, CA. As a father, I’m always asking myself “what is my job in relationship to my child. Exactly what is it am I supposed to do?” When my boy was born, all the light and wisdom that I’d been searching and longing for all my years in this Earth shone brightly out of his tiny little eyes. Who was he? Who IS he? At first I really only had to take care of my beloved Nubia as she nursed him, and then gradually the nurturing was spread more evenly between us. But he already knew everything! Well, his limbs weren’t working that well. Or his words. But the knowledge was there. I could just see it in his glowing face and loving gestures. So I simply worshipped him as Divine, as my own personal manifestation of baby Krishna Gopala. I sang to him, bowed to him, played with him. People said “Oh, how beautiful. You’re giving such a spiritual background to him at such an early age.” But I knew that I was the one getting the blessings, the healings, the spiritual uplifting…..
Gradually, however, the many streams of human life began to mingle with my boy’s incredibly wise innocence. Personality, wanting, individualization, the joy of saying “NO”…. But still his eyes shone. Singing to my Gopala gradually changed to singing WITH my Gopala. And as the practice of Kirtan reminds him of his divine nature, I realize that mostly it’s me who needs the reminding. I fall asleep most of the time. And my boy wakes me up. And then we sing. And then, of course, we PLAY! When Ezra Gopal was first born a friend commented to me with some sympathy that my devotional practices must really be suffering as I devoted more and more time to being a daddy. I laughed inwardly, as only an exhausted parent can. But I also rested in the wondrous reality and knowledge that Bhakti, or devotion, only begins when we take ourselves out of the ‘number one’ spot and put another one there. And what better way to experience service than having a child. The surprise was that as I quite naturally and happily began to put my son’s needs before my own, I couldn’t help but notice that God seemed so much closer, and Kirtan seemed so much richer. Anyway, six years have passed. We’ve travelled through the forests of Pokemon, the crazy world of Tom and Jerry, the exploits of super heroes and mutants. But still home base is always Hanuman, Radha & Krishna, Shiva, our Gurus and all of our great unseen friends, helpers and protectors. I invite all of us mommas and poppas to enter the amazing world of Kirtan, to sing with our little ones, to take turns leading, and to keep our hearts and minds ever more open to the mysteries, the miracles and the infinite love that always surrounds us. Kids get in on ancient love songs in Jai Uttal’s musical celebration of childhood innocence and wonder. When kirtan artist Jai UttaI’s son, Ezra Gopal, entered preschool in 2008, the Grammy-nominated musician discovered a new audience for his devotional chants—and new artistic inspiration. 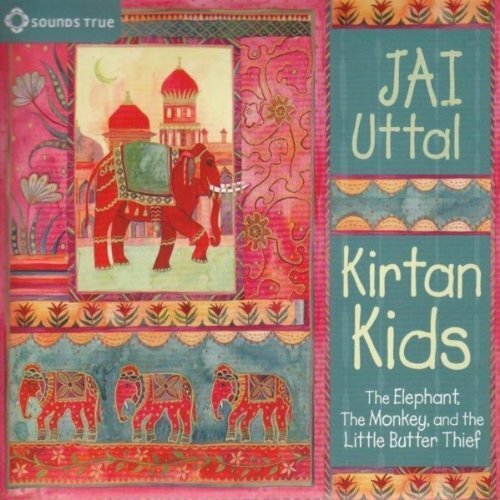 Uttal’s guest appearances at his son’s school were big hits, showing him how much young children appreciate kirtan, the yogic practice of chanting God’s names. The experience led him to start hosting children’s kirtan events near his home in Northern California and to create an album especially for children, Kirtan Kids: The Elephant, the Monkey, and the Little Butter Thief, released this autumn. Though children may be dawn to kirtan, many kids can’t sit still through a “grownup” kirtan event (or album) with many songs lasting as long as 45 minutes. So Uttal developed a format that works for kids. Kirtan Kids re-creates the feeling of these events and gives parents a new way to introduce children to kirtan. The album features a chorus of children, including six-year-old Ezra, on every song. It offers other surprises: an elephant solo, the sounds of banging pots and pans, and music from about a dozen instruments, including the glockenspiel and a toy piano. The songs are shorter than what you might hear on “grownup” kirtan albums, and some of the call-and-response sections are simpli?ed so that the kids will have no trouble singing along. The album includes narrated tales of Gopala, the child form of Krishna; the elephant-headed god Ganesha; and the monkey god Hanuman. Produced by Jai Uttal and Ben Leinbach. Jai Uttal- vocals, acoustic and electric guitars, banjo, keyboards, glockenspiel, xylophone, melodica, toy piano, toy clarinet, ipad turntable scratching, bass, water bottle, whistling, loops and samples. Ben Leinbach- keyboards, bass, drums and percussion, pots and pans, xylophone, mouth drums, nose whistle, loops and samples, vocals. Join the discussion about Kirtan Kids!